As Kootenay kids headed back into the classroom this September, Wildsight educators were scheming to get them right back outside again. Every year, across the Columbia Basin, our team of 25 environmental educators bring the magic of nature to thousands of kids, from Kindergarten all the way up to high school. Through field trips to explore ecosystems in students’ own backyards, a half-year investigation into the systems that sustain life as we know it, and a chance to take action to help their local environment, Wildsight educators introduce young minds to the wonders of the natural world. But after nearly two decades of taking students outside, we’re convinced that once is never enough. One field trip per year only scratches the surface of nature’s complexity. One field trip piques students’ interest, leaving them wanting much more. That’s why our team has excitedly been developing Nature through the Seasons, which weaves the magic of the changing seasons through the entire school year. In this collaborative program, students, teachers and Wildsight educators set off together on a journey that lasts from September to June. Building on Winter Wonder, we’ve added two more field trips—Amazing Autumn and Signs of Spring—and built a series of lessons, activities and games to help teachers of Kindergarten to Grade 3 integrate the wonder of the changing seasons into their classrooms all year round. If there’s one constant in our complex ecosystems, it’s change. No plant or animal stays the same and as they change, the connections between them fluctuate. As the seasons ebb and flow, the web of life pulses and flows in the adaptive dance driven by the earth slowly tilting on its axis. From that web, we invite students to follow threads deep into the mysteries of life. 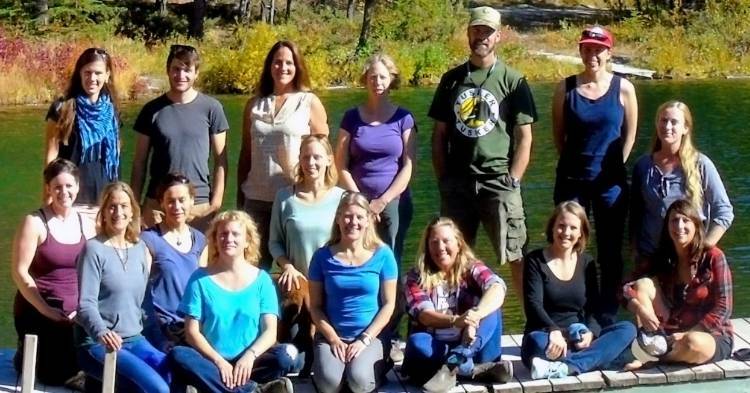 Part of our education team at a Blue Lake training retreat this year. Wildsight educators launched Amazing Autumn in September, and what an autumn it was! This year’s vibrant golden larches and rich red leaves lent extra magic to our first Nature through the Seasons field trips. Budding ecologists followed the threads of autumn leaves falling to the ground and the stalwart needles of evergreens, the adaptive camouflage that plants and animals use to stay safe against the changing colour palette of the seasons, and the preparations nature makes for the long, cold winter. From twelve classrooms in this, the pilot year, to many more in the future, we’re excited to follow Nature through the Seasons for years to come. But Nature through the Seasons is just one of our half-dozen programs that bring nature into the classroom (or the classroom out into nature) throughout the Columbia Basin. Primary students start with four distinct years of half-day field trips in Winter Wonder. Intermediate students head outside for full-day field trips over three years of Classroom With Outdoors, becoming scientists who explore a wetland, grassland or forest ecosystem in their wild backyards. For teachers and students who want to go deeper, EcoStewards takes intermediate classes out into their community on an action project to help protect the wonder of nature that they’ve just learned about in Classroom With Outdoors. In the classroom, Grade 5 students go Beyond Recycling on a 24-week journey to explore energy, waste, consumption and the impacts of our lifestyles on the planet. Students visit their local waste transfer station or landfill, lead Earth Day activities, explore the science of our climate, trace the lifecycle of products and learn how they can become positive agents for change. And for Grade 9, Know Your Watershed is a Columbia Basin Trust program that is administered and delivered by Wildsight. Connecting Grade 9 students with their local watersheds, Know Your Watershed teaches students about the water life cycle, takes them on a visit to their local water system and sewage treatment facility, and connects them with their local water stewardship community groups. Environmental education has been a key part of our work since 2000 when we launched the Magic Basin field trips. There is simply no more important investment we can make than in our children and the next generation of leaders. Over 17 years, Wildsight has taken more than 70,000 kids outside to connect with their wild backyards. Joining us in making that investment are our generous funders who allow us to offer our education programs at no charge. Our thanks to the Columbia Basin Trust, Fortis BC, Columbia Power, TD Friends of the Environment, the Columbia Shuswap Regional District, the Regional District of the Central Kootenay, the BC Gaming Commission, the National Sciences and Engineering Research Council and of course the generous individuals who support our education programs. Top photo by Michael Royle.